I love adventure blogging. First, it requires an adventure. Check. Second, there are sure to be some family “discussions” (loosely translated “tense voices”) on how we are doing what we are doing. Check. Check. Yep, I am adventure blogging now. It really started as a quick trip to Nashville during spring break. From there we would drive to Atlanta for ice dance testing. Then home. True to Blankenship form, we had no sleep accommodations when we left the house. No road map planned out. No ideas on where to eat. Just get from point A to point B and figure it out along the way. If you don’t travel like that, there is an adventure right there. It doesn’t bother Brandon or Anna, but it ties my stomach in knots. I’m learning to embrace the adventure of it. The trip to Nashville was uneventful. We have made it there many times. We bid on a hotel through Priceline.com and got half off at a Marriott. Not bad. However, I did start to think that Netflix binge watching “Person of Interest” made me hyper aware of all the exits, weird behaviors of the hotel guests, and make-shift weapons in case we got attacked. We headed over to Franklin, one of our favorite towns, and did some restaurant hopping. Appetizers and coffee at the Frothy Monkey (most excellent cheese and fruit tray!) and supper at Puckett’s Boathouse with a live band. In between, we walked the downtown area checking out all the shops and historical markers. Altogether very pleasant. The trip from Nashville to Chattanooga to Atlanta was a whole different story. A few miles outside of Murphreesboro, I-24 shut down. I mean, in the middle of nowhere, everybody came to a complete stop and sat there for about two hours. The police blocked people from crossing the median to go back. Several truckers blocked the shoulder so that impatient people could not speed past the traffic to get off at the next exit, 2 miles down the road. (Seriously, thank you! That is so irritating and dangerous.) Lots of people were standing outside their cars, wandering around, and chatting. Brandon and Anna were asleep, so I of course woke B up to help me find an alternate route….and because duh. Misery loves company. I searched the AM and FM channels for traffic news, to no avail. Then the public potty breaks started. Grown men running into the woods to relieve themselves. Worried women pacing. College kids making a party of the whole situation. The cars inch forward a few feet. What if road block is another one of those trucks carrying millions of bees that turned over? Too bad we don’t have our bee suits in the car. At one point we were stopped over a lake on a really tall bridge. 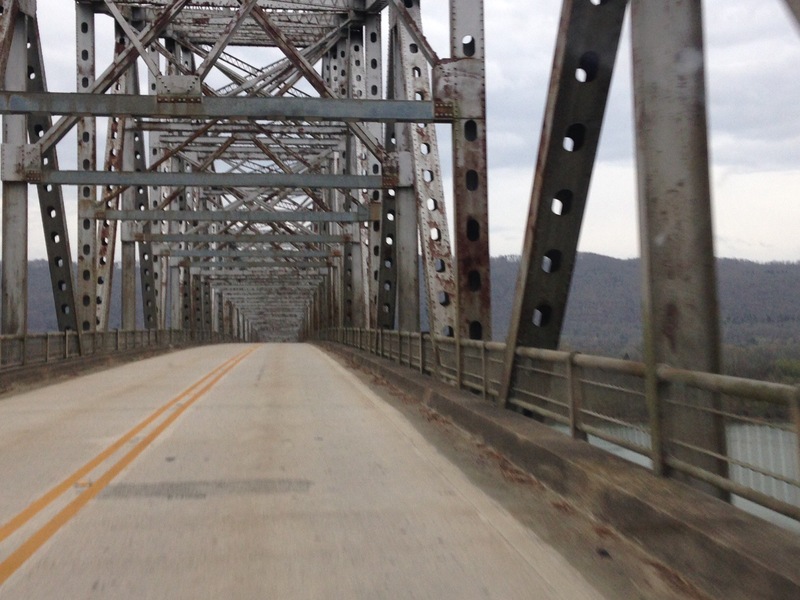 As the semi trucks whizzed by on the oncoming lanes, the whole bridge would vibrate and freak me out. Again, I blame too many James Bond, Die Hard, Mission Impossible movies. I could totally see this as a rogue terrorist group hijacking the interstate and blowing the bridge to cover their escape, plunging thousands of innocent people to a murky death in the freezing waters. I planned, that as we sank into the river, we would quickly unbuckle, make our way to the last remaining air pocket in the car, and take our last deep breath before kicking the door open and swimming through the debris to the surface. Brandon would of course be injured and unconscious, so I would get Anna to help me carry him to the surface, but if she couldn’t, I instructed her to leave us and save herself. In an act of bravery and heroism, she would make it to the top and come back down to save us both. The traffic started moving again. We finally got off the interstate after two hours of going only 2 miles. We stopped right there at the over crowded fireworks gas station (who thought that was a good combo?) and kissed the ground before stretching. We had made it out of the traffic and off that bridge! We made the Blankenship family decision of going the opposite way of all the diverted traffic, and feeling our way towards Atlanta. Our personal detour took us through multiple small towns. By the way, in a lot of small towns, the gas station quick stops don’t have public restrooms. File that away for future use. Our Siri GPS calculated and recalculated a lot of back roads, and I imagine if she were a real person, she would have been yelling at us. There were a few times I was tempted to yell at “her.” As it was, we went south before Chattanooga back into Alabama going west. Then found another road that took us southeast through Mentone and then back into Georgia. Lots of curvy mountain roads going up and down and winding through three states. We have now been to South Pittsburg and travelled on Turkey Mountain Road. Yay us! Our arrival time in Atlanta jumped from 5pm to 9pm. Of course, we had to jump forward an hour for Eastern time and then there is an extra hour to Spring Forward for Daylight Savings Time, so I really have no idea what time it is. And since Anna is testing in the morning for ice dancing, we have to BE THERE at 5:30 a.m., so I’m not even sure how much sleep we are getting. This is too much math for Spring Break! Lesson to learn here? Use a real map people! Siri and google maps could be hijacked and they will lead us all into some kind of concentration camp where we will all be interrogated for our top secret Intel. When traveling, put yourself in the adventure mindset so you won’t go crazy. I do love that about my family. We are up for just about any kind of a spontaneous adventure. This was one brought to you by the I-24 shutdown outside of Murphreesboro, TN. P.S. I should probably cut back on the movies. Some adventures are all in my mind. ?